Pack of 2, silicone baby soothers that glow in the dark. These soothers have orthodontic, symmetrical and collapsible teats that are taste free and odourless. Ventilation holes in the shield prevent saliva build-up and reduce the risk of skin irritation. 0% BPA. Glow in the dark. Comforts your baby. Snap on hygienic cap. For your child's safety<br>WARNING! Inspect carefully before each use. Pull the soother in all directions. Throw away at the first signs of damage or weakness. Only use dedicated soother holders tested to EN 12586. Never attach other ribbons or cords to soother, your child may be strangled by them. Do not store a soother in direct sunlight or near a source of heat, or store in disinfectant ('sterilising solution') for longerthan recommended, as this may weaken the teat. Keep the removable teat protector away from children to avoid suffocation. Before first use, place in boiling water for 5 minutes, allow to cool, and squeeze out any trapped water for the soother. This is to ensure hygiene. Clean before each use. Never dip teat in sweet substances or medication, your child may get tooth decay. Replace the soother after 4 weeks of use, for safety and hygiene reasons. In the event the soother becomes lodged in the mouth, DO NOT PANIC; it cannot be swallowed and is designed to cope with such an event. Remove from the mouth with care, as gently as possible. Always use this product under adult supervision. Keep it in a dry covered container. Soothers and caps are suitable for all commonly used forms of sterilisation.<br>Wash your hands thoroughly and ensure surfaces are clean before contact with sterilised components. 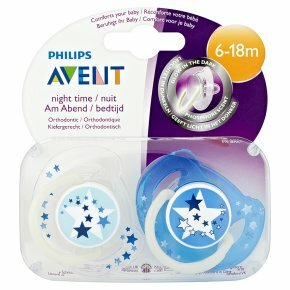 Night time soothers - expose handles to light before use. The soother can be cleaned by washing with warm water. DO NOT use abrasive cleaning agents or anti-bacterial cleaners on the soothers. Excessive combinations of detergents may eventually cause plastic components to crack. Should this occur, replace your soother immediately. DO NOT sterilise the display case.